FAIRFIELD, Calif., Oct. 11, 2012�� /PRNewswire/ – Jelly Belly Candy Company adds sweet heat to the menu with TABASCO� Jelly Belly jelly beans. The candy makers set out to develop a flavor so authentic that they sourced genuine TABASCO� brand seasoning from the 140-year-old recipe made by McIlhenny Company of Louisiana. 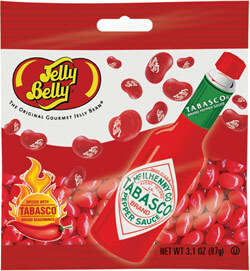 The Jelly Belly beans will ignite the taste buds with a peppery punch that hot sauce fans will crave.